← 3 Sidewalk Grants Recommended for Approval! Cycles for Change brought a week long bicycle safety class to the 6th grade PE classes at Creekside Middle School. For the class, each student was provided with a bike, helmet, safety instructions and taught the skills they would need to travel around on their bikes. The following is a recap of the week by participating 6th grader, Megan Baldwin. 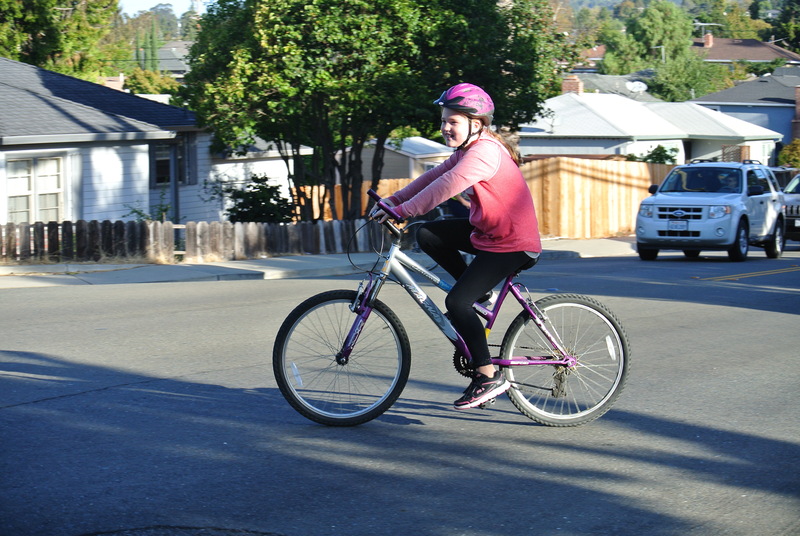 Creekside Middle School student Megan Baldwin riding her bike in the bicycle safety class. Yay! It’s bike week in PE class. Today we watched a bike safety video. It explained how to make sure your bike is the right size, and how your helmet should fit. Next it showed us how to ride safely in the streets, and the rules of the road. It also taught us how to communicate with cars and other bikers/pedestrians on the road. Oh No! It is raining! Luckily, we still got our bikes! Our instructors reviewed with us how to make sure a bike fits properly, then we got up and chose a bike. Once we had our bikes, our instructors explained the ABCQ check (Air, Brakes, Chains, and Quick Release). Then our instructors taught us how to switch gears on our bikes. 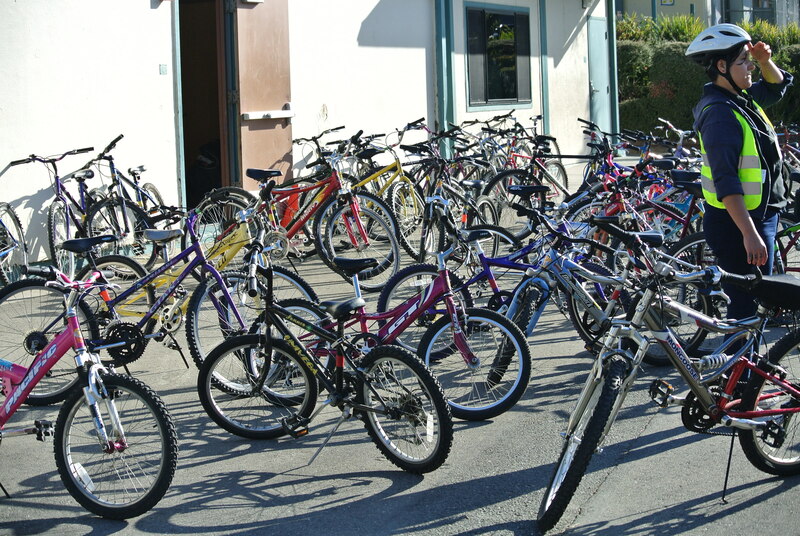 Bicycles for the bicycle safety course at Creekside Middle School. Today we did an exercise called lane drills. Our instructors made lanes on the blacktop for us to ride on. We learned how to do shoulder checks and sudden stopping. We learned how to do sudden stopping by playing “red light, yellow light, green light”. It was fun learning new bike techniques by playing games! Today we learned how to ride safely in intersections. Our class left campus to a small intersection next to our school. We got in lines and practiced left and right hand turns. We also learned how to determine who goes first in an intersection. By doing this, we learned how to communicate to other bikers and cars which direction we are going. This exercise also gave us practice with our hand signals. Today we took our skills to the roads of Castro Valley! We took a bike ride around town, traveling on Gem, Center, Veronica, Marshall, Omega, Fern and Edwards. Each of us were riding our bikes in a line, practicing arm signals, stopping signals, and group riding skills. It was so much fun! 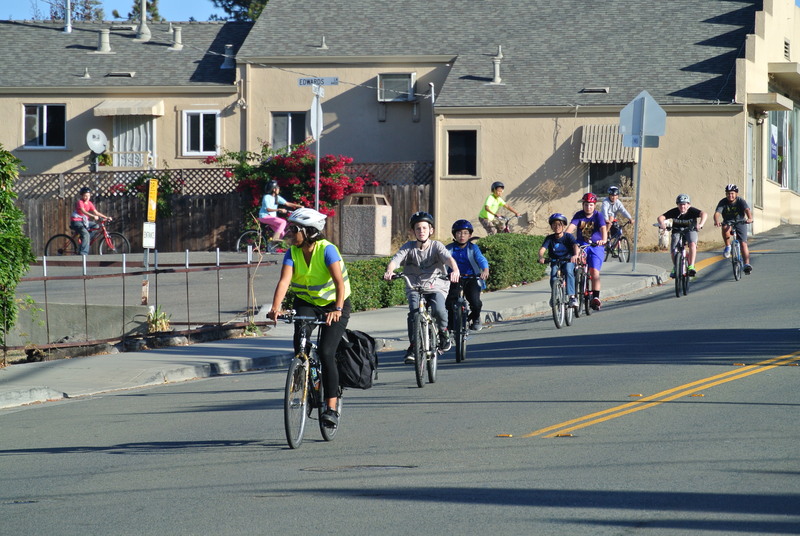 Creekside Middle School students riding their bikes around Castro Valley as part of their bicycle safety course.